Bauer NSX elbow pads Senior are price-crushers and fall into the recreational category when it comes to protection and price. The NSX elbowpads fit all the needs of players who are new to the skater- or icehockey. The NSX elbow pads feature a molded 2-piece tapered cap with medium density foam cover. The bicep protection on the Bauer NSX elbow pads Senior is made with medium density foam and has an extension to help cover and protect your joint. This bicep protection is independent from the cap, which a feature you see on higher level pads for improve movement and comfort. 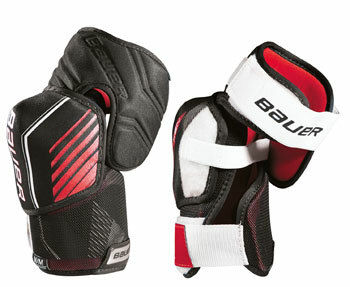 For a secure fit, Bauer uses 3 straps on the NSX elbow pads at the bicep, joint, and forearm. The liner on the NSX elbow pads is a hydrophobic mesh for a dry comfortable fit. The Bauer NSX elbow pads are designed with the new hockey player in mind.